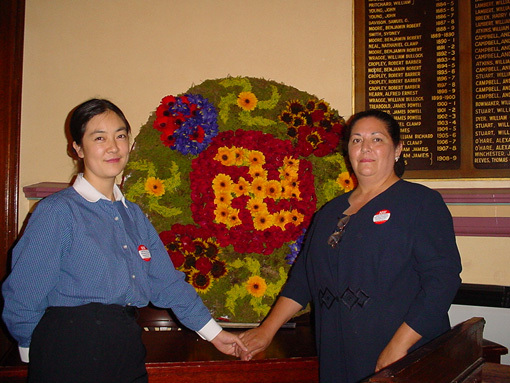 Myrna Mack and Jennifer Zeng in Sydney, in 2001. 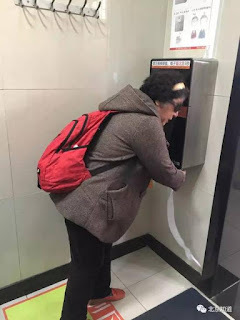 Today I saw a piece of news, which says that in order to prevent people from taking toilet paper in the public restrooms to their homes, smart machines that can scan and recognize people’s faces were installed in the public restrooms in Temple of Heaven (Tiantan) Park in Beijing. A westerner might find this news astonishing and hard to understand. And this also made me recall an “insignificant”, but true story in 2001. This “insignificant” story was somehow related to, and happened right before a very historically significant event on November 20, 2001. 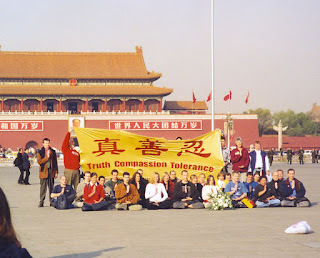 On that day, 36 westerners from 15 different countries gathered at Tiananmen Square to appeal for Falun Gong. This event shocked the entire world; as well as the the Chinese Communist Party leaders, who vowed to eliminate Falun Gong completely from China and from the planet within 3 months when they launched the most overwhelming persecution in July 1999. 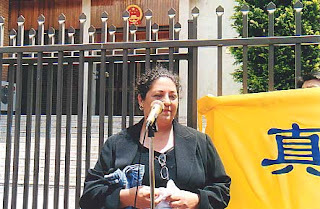 One of the 36 westerners who participated in the protest was Myrna Mack from Sydney. I was staying with her before she went to Beijing. At that stage I had just escaped from China for about 2 months. 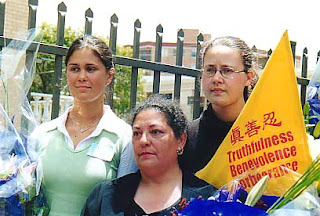 Fellow practitioners arranged for me to stay with her while they tried to seek interview opportunities for me with the media to expose the persecution I suffered in China for practicing Falun Gong. 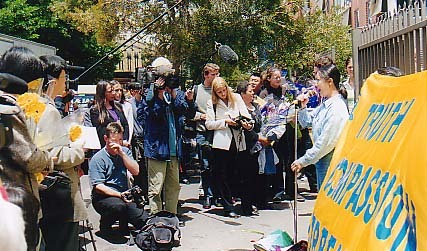 As Myrna had never been to Beijing before, she planned to arrive several days earlier so that she could do some sightseeings before she went to Tiananmen to protest. We both knew that the result of their protest could be arrests and possible torture. But she was determined to go anyway. I said, “As people will take all the paper home if it is provided. I must admit that this was the most embarrassing question I ever had in my life. How could I explain to her why my fellow Chinese people would take toilet paper in public restrooms home? I don’t remember how I managed to answer this “innocent” question of hers. Anyway, after that Myrna did fly to Beijing, did do quite some sightseeings, did show up at Tiananmen Square on time, and did have been beaten up before she was arrested and then deported back to Australia. She did seem to have experienced a lot in just a few days; and her voice trembled when talked about her experiences and showed the reporters her ripped T-shirt. But overall, she was still very composed; and a little bit sober. After the press conference, we went back home together. She then told me that she was so grateful that I had offered her that most important and valuable advice before she left. 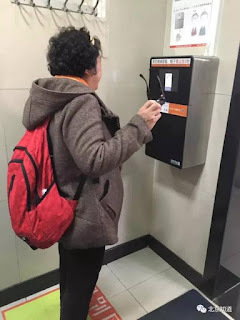 Otherwise she could have experienced more bad things other than the beatings, as she did find that no toilet paper was provided at public toilets in Beijing. She also told me that now she understood why being put near a toilet was a punishment in China. She said before she went to Beijing, she often read articles by Chinese Falun Gong practitioners at en.minghui.org, talking about that they were forced to sleep right beside the toilet as a punishment when imprisoned. She would think to herself: “Why was this a punishment? My bedroom is also right beside my bathroom. Every night I also sleep right beside the toilet. Why was this a punishment?” She couldn’t figure out; but didn’t know who to ask. She said after she came back from Beijing, she understood. When traveling alone in Beijing, she didn’t have to ask people where the toilet was. She usually just smelled it. The terrible smell of the toilets always told her where to go. Well, that was the small story about 15 years ago. Today both the society and the technology are much more advanced, so toilet paper is actually being provided in public toilets, accompanied by smart face-scanning machines to prevent people from taking the paper home. Shall we say “congratulations” for the advancement? Oh, China, my dear China, when can you be free of the Communist party’s poisoning; and really become party of the civilized world? 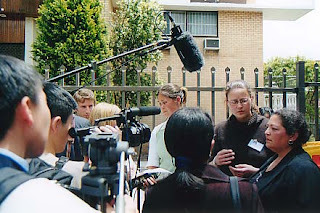 Myrna Mack talks about her experiences in Beijing at the press conference in front of the Chinese Consulate in Sydney on November 22, 2001. 36 western Falun Gong practitioners from 15 countries protesting at Tiananmen Square on November 20, 2001. Myrna Mack is at the third at the right side of the first row. 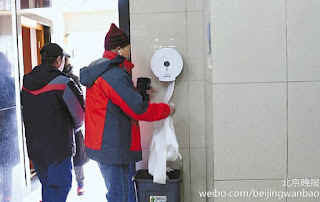 A Chinese man taking toilet paper from a public restroom in Beijing. A Chinese woman standing in front a face-scanning machine to wait for her face to be scanned. The paper is only available after the scan finishes. The paper finally comes out after the scan of her face finishes.